We raise our funds from local sources. We support the efforts of Habitat for Humanity International by tithing 10% of all donations for use in building Habitat houses in developing countries unless the donation is restricted for use in Grayson County. For much of our history, we have been able to build “a house for a house”-one house internationally for each house built in Grayson County. To date, Habitat for Humanity of Grayson County has donated more than $100,000 and has funded 28 houses in developing countries, and our current international partner is Haiti. That’s a street full of families who would otherwise be living in poverty or overcrowded housing. We would love to visit every one of those families some day! Send donations to PO Box 2725, Sherman, Texas 75091 or click the Donate button above and support financially the mission of Habitat for Humanity of Grayson County. Donated goods and services help us to fulfill our mission. Current needs include building materials and office supplies. 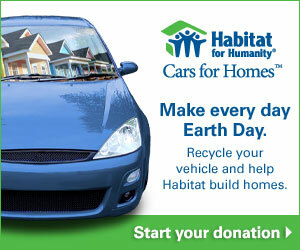 Donate a lot in Grayson County to be used to build a Habitat house or sold to purchase lots in targeted neighborhoods. Select from the wish list. Work site supplies- utility knives, tape measures, work gloves, paint brushes and rollers, dust masks, duct tape, etc. Please call Laurie Mealy at (903) 893-0009 if you have any item you’d like to donate to Habitat for Humanity of Grayson County. FYI – A copy of the current financial report and the Form 990 are available for public review at the Habitat office, 901 N. Grand Avenue, Sherman. Click here to read about the Square Foot Club.